HCM City (VNA) - Southern provinces and cities will strive to achieve total retail sales and services revenue of more than 2.07 quadrillion VND (91.4 billion USD) in 2017, a year-on-year increase of 11.5 percent, and total export revenue of 104.9 billion USD, up 11.6 percent over last year, officials have said. Speaking at a recent meeting of the industry and trade sector of southern cities and provinces in Ho Chi Minh City, Le Thanh Liem, Vice Chairman of the HCM City People’s Committee, said 20 provinces and cities in the south accounted for more than 60 percent of industrial production value and 57 percent of retail sales and services revenue of the whole country. In the past years, the industry and trade sector in the south has relentlessly enhanced co-operation and links through many practical programmes. In the context of increasing integration and competition, links and co-operation between localities to make the most of regional advantages is important, he said. Therefore, provinces and cities in the south will continue to have solutions to effectively implement strategic co-operation and links to maintain the position of the region, he said. Agreeing with Liem, leaders of the Departments of Industry and Trade of other cities and provinces in the south said that the links between localities should be strengthened to support regional planning, promote goods circulation, improve product quality as well as ensure outlets for their products, and inspect and manage the market and food sources better. In addition, links would help with market demand forecasting so traders and farmers can come up with suitable production and business plans and increase their competitive capacity. To realise the targets set for this year, departments of industry and trade in the region will co-ordinate with relevant agencies to continue carrying out measures to ensure a stable supply of goods and prevent prices from sudden increases, delegates said. In addition, localities in the south will also continue to develop their distribution systems in accordance with regional planning to promote the circulation of goods and balance supply and demand, contributing to the development of the trade sector, they added. 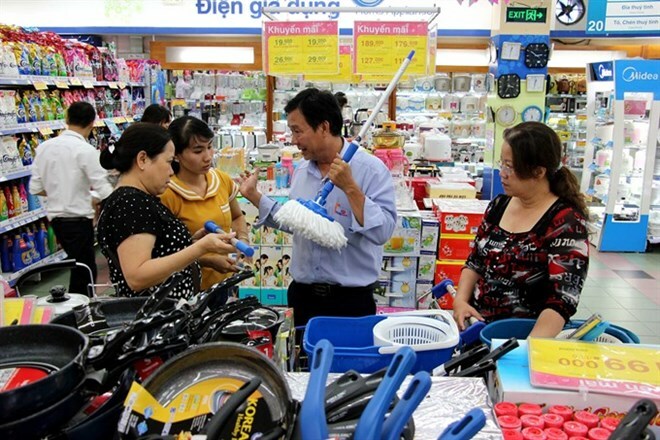 A report at the meeting showed that total retail sales and services revenue of southern provinces and cities during the first six months of the year reached 1.2 quadrillion VND, an increase of 8.9 percent over the same period last year. Of this amount, Binh Duong, Dong Nai and HCM City achieved the highest growth rates in retail sales and services revenue, going up by 20 percent, 11.45 percent and 10.2 percent, respectively. At the meeting, Deputy Minister of Industry and Trade Do Thang Hai highly appreciated the achievements made by the south’s industry and trade sector, saying that many countries, including Vietnam’s key export markets, will continue to apply technical barriers and protective measures, causing difficulties for local businesses.